The USS Hawaii is tasked with providing security, counter-intelligence, and counter-terrorism by Starfleet. Federation President Jarul Bezar commissioned the new vessel in 2388 to help combat the Gorn invasion at Cestus and Canterra. Hawaii’s orders are clear: Establish Ground Operations on Canterra IV. After a long career aboard one of Starfleet's archetypal "space hotels," living a peaceful life with his family, Juan Zamora is a man thrust into the crucible of conflict. Serving as first officer aboard the combat vessel Hawaii is a universe apart from his former life as a peacetime diplomat. Already he has had to learn some hard lessons about the nature of war in the 24th century. Now, in this unfamiliar and hostile environment, he must use his skills to help guide his ship through the murky and difficult political situation along the Gorn frontier. And he will find out just how far he is willing to go for the sake of peace amongst the stars. Tolkath is tall and athletic, with classic male Vulcan features. Dark hair in the traditional style, dark green eyes. By human standards he appears much younger than his fifty four years and most would think him being no more than late thirties. . Tolkath generally presents the aloof calmness and emotional detachment characteristic of Vulcans. He is normally soft spoken and considers his words carefully. While his mental and emotional control is well established and he has purged extraneous passions, those who know him well believe him to have a dry and pointed sense of humor. Born and raised in the space-bound lifestyle of asteroid miners, Cassidy's joining of Starfleet keeps him where he performs best - behind the controls of a ship. A former test pilot, he has pressed for an assignment on the Beta Quadrant front with the stirring troubles from Gorn and Klingons alike. Amiri is a hard working, well educated doctor in many varieties of veterinary medicine, as well as xeno-medicine. S/he had both Kazarite and Hermat parents that give hir, hir appearance and gender. Kazarites have a strong connection to all animals non-humanoid and humanoid. They are covered in fur, walk on their digits (like paws) and have a cute prehensile tail. Amiri's fur pattern is similar to a white tiger. S/he is a hermaphrodite and attempts to enjoy hir dual nature whenever possible. The Hawaii's assistant science chief is young and enthusiastic about his chosen field. He was the potential to be brilliant, but needs that brilliance channelled properly. Initial impressions are of a tall, athletic and rugged human male. He has short cropped light brown hair and blue eyes. Not classically handsome, although he has well defined lines, his best feature is a ready smile. Kyle is currently working with Captain Bolingbroke on getting the "Frog" Squad ready to infiltrate the Gorn forces. Brimming with energy and ready to take on the world, Jenny is the gallant leader of the Golden Knights, USS Hawaii's resident Starfighter flight. A loud, vivacious, larger-than-life personality, she flies and fights and laughs along with her friends and crew mates. Guaranteed to stand out in a crowd she is the Hawaii's happy warrior, seeing herself as a Knight in shining armor, and completely certain that she can best every challenge the Gorn conflict has waiting for her. The USS Hawaii is docked with Xavier Fleet Yards (XFY) along with the USS Devonshire to assess the operational capability of the station as the crew dealt with the fallout of the previous Battle at Canterra and conducted repairs both to Hawaii and XFY. During the brief to the USS Devonshire's Senior Staff, klaxons blared RED ALERT as the new-type Gorn Cruiser engaged the ships and XFY. The USS Hawaii conducted an Intelligence, Surveillance, & Reconnaissance Patrol along the Gorn Front near Canterra where she rendezvoused with the USS Wyoming (the ship the Hawaii was to meet per their orders), a Steamrunner-class vessel, and the two engaged a new-type Gorn Cruiser in the Battle of Canterra. 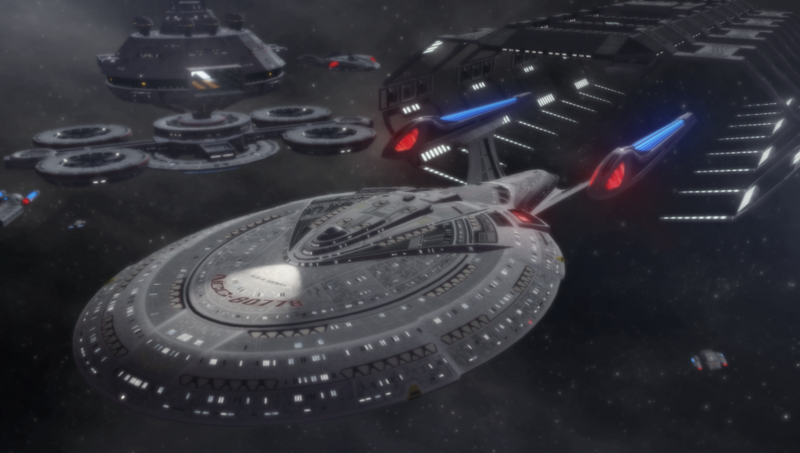 The USS Hawaii conducted a shakedown cruise to Bre'el IV after completing final construction in spacedock at Providence Fleet Yards. Her mission was to ascertain the availability of Bre'el IV's transport/supply vessels for the Gorn Theater. En route, the USS Hawaii received an ominous warning from Bre'el IV.